Parade House is a unique family run business that offers residential care within a warm & friendly surrounding. Parade House is registered for 20 residents providing tailored care 24/7. With spacious attractive rooms, a beautiful garden, a private reading room, Parade House sets the standards in private residential care. Residents are encouraged to bring personal possessions to make their bedrooms a ‘home from home’ experience. 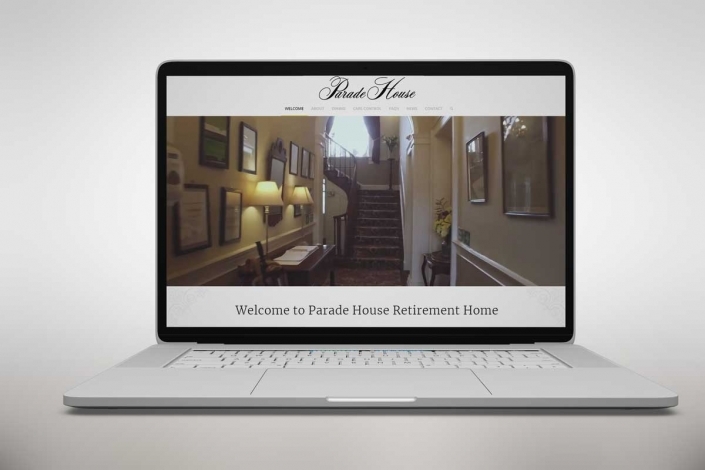 Parade House had experienced some website issues with a past web designer and came to me to ‘start again’ which is what we did. Parade House came to Here For Design after finding many recommendations on Social Media for a web designer in Monmouth. They really needed to have a website that conveyed the culture and ethos of Parade House, one that looked and felt as Parade House feels. James has already picked a website theme and was looking for someone to build the website around his thoughts, after an initial meeting I went to back to the drawing board and asked if we could go in a different direction, one that I felt would show off the house in a better way. This, in my opinion, highlights the value of a face to face meetings with a client and designer – sometimes the client has an idea but you know as a designer that it probably will not work (this isn’t always the case) but at the end of the project the client was very pleased with the results we had created together.